Women who had direct and indirect experiences with gender-based violence during the Yahya Jammeh dictatorship have been gathering in The Gambia with the support of ICTJ and a group known as the kaneleng. In December 2018, the kaneleng gathered for a two-day summit to work on ways to engage women from communities who will be involved in national truth-seeking processes. The training included discussion of specific and systemic human rights violations and as well as the taboo topic of sexual and gender-based violence. Kaneleng are women who cannot bear children or whose children died at an early age. The high value placed on female fertility in Gambian culture means that kaneleng often suffer social exclusion and, in response, have formed support groups, using the power of traditional song, story, and rituals. Kaneleng’s liminal standing in Gambian society make them free to discuss difficult or taboo matters that would otherwise be forbidden in public discourse. As the kaneleng are an essential part of the social fabric, attending public events and celebrations, and bringing messages to the community, ICTJ and its partner the Gender Action Network and the Truth Reconciliation and Reparations Commission recognized that they could play a key role in making transitional justice processes more accessible and inclusive. 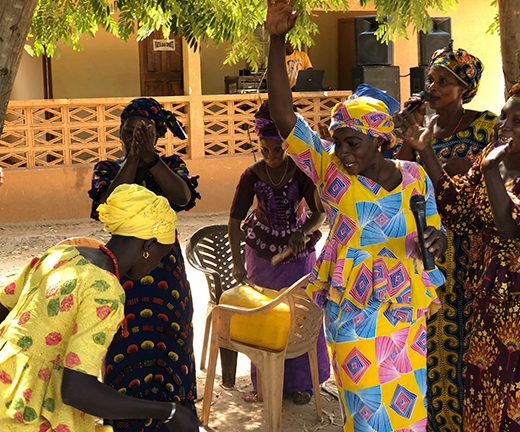 The hope was that they could reach women in remote, rural and low-income communities outside of the greater Banjul zone—areas where the kaneleng have traditionally occupied space in Gambian society. At the workshop, the kaneleng received training on transitional justice concepts and the TRRC. They worked to develop songs, comedy, and dramas that they will use to present justice messages through their work as traditional communicators. The group of 25 women welcomed the chance to take a lead role in educating their home communities. As Baldeh notes, they appreciated their expanding role in transmitting knowledge and the growing sense that it was valued by others. The workshop also raised difficult issues in the kaneleng’s own lives, giving them a safe space to share their stories and laying a powerful foundation for deeper work with the women victims across the country. PHOTO: Kaneleng discuss transitional justice issues at a workshop in December 2018.